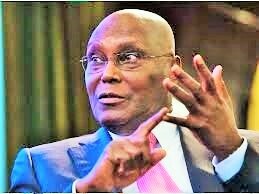 By Sadiq Umar – Former Vice President and Presidential aspirant on the platform of the Peoples Democratic Party (PDP), Atiku Abubakar says Nigeria is a nation at a crossroad because her people elected a president in 2015 who had succeeded in dividing them. Mr. Atiku, who spoke to Anambra PDP delegates in Awka, Wednesday, said Nigeria under the Muhammadu Buhari’s administration, is more divided than the way it was during the Nigerian civil war, urging the people to unite to ensure that All Progressives Congress, APC, does not return to power in 2019. “I beg of you, it is not about me, but about the future of our children. We must unite to make sure we don’t vote for APC anymore,” he said. Adding: “Our country is at a cross road. I have never seen this country so divided than it is today. We are more divided as a country today simply because we mistakenly elected a president who has succeeded in dividing us the more. “I saw the pre- civil war days, the civil war days and the post-civil war days, but I have never seen Nigeria as divided. Under this government, Nigeria is more divided than the way it was during the Nigerian civil war. “We elected a government that is completely insensitive to our diversity, completely insensitive to our welfare. We elected a government that crashed Nigeria into a recession from an economy that was growing at six per cent Gross Domestic Product, GDP, and up till now, we are trying to recover from the recession. “Today, we have the highest unemployment rate in our history, with over 12 million young men and women unemployed. “Today our health sector is performing very minimally and Nigeria is at the bottom as far as heath care is concerned. Almost every African country is ahead of Nigeria. “In almost every socio-economic indicator, we are doing worse today. This is a government we must vote out next year. For the welfare of our people and for the sake of our children and grandchildren, this is a government we must not allow to return to power next year. “We must not continue to have a country where every state rushes to Abuja to pick up money to develop their states. “We will begin by restructuring and that will help states to achieve whatever they want to achieve without hindrance,” he added.